Efficient in vivo nucleic acid-liposome complexes have unique features, including their morphology, mechanisms for cell and nuclear entry, targeted delivery, and ability to penetrate across tight barriers and throughout target tissues. Liposomes have different morphologies based on their composition and the formulation method that contribute to their ability to deliver nucleic acids in vivo. 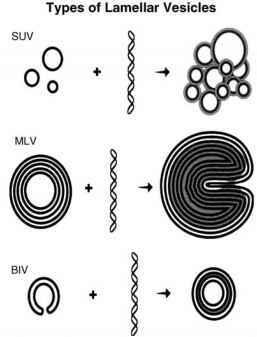 Formulations frequently used for the delivery of nucleic acids are lamellar structures, including small unilamellar vesicles (SUVs), multilamellar vesicles (MLVs), or bilamellar invaginated vesicles (BIVs) recently developed in our laboratory (Fig. 1). Hexagonal structures have demonstrated efficiency primarily for the transfection of some cell types in culture and not for in vivo delivery. SUVs condense nucleic acids on the surface and form ''spaghetti and meatballs'' structures.1-9-1 SUV complexes produce little or no gene expression upon systemic delivery, although these complexes transfect numerous cell types efficiently in vitro. Furthermore, SUV liposome-DNA complexes cannot be targeted efficiently. extreme discomfort to the patient. Adding ligands to doxil for delivery to specific cell surface receptors did not result in much cell-specific delivery, and most of the injected targeted formulation still accumulated in the skin, hands, and feet. Addition of PEG in BIVs also caused steric hindrance that prevented efficient encapsulation of nucleic acids, and gene expression was substantially diminished. MLV complexes appear as ''Swiss rolls'' when viewing cross sections by cryoelectron microscopy. These complexes can become too large for systemic administration or deliver nucleic acids inefficiently into cells because of inability to ''unravel'' at the cell surface. Addition of ligands onto MLV liposome-DNA complexes further aggravates these problems. BIVs efficiently encapsulate large amounts of nucleic acids of any size between two bilamellar invaginated vesicles. We created these unique structures using 1,2-bis(oleoyloxy)-3-(trimethylammino)propane (DOTAP) and synthetic cholesterol (Chol) and a novel formulation procedure. Addition of other DNA condensing agents including polymers is not necessary, and encapsulation of nucleic acids by BIVs alone is spontaneous and immediate. The BIV complexes are also large enough so that they are not cleared rapidly by Kupffer cells in the liver, and yet extravasate and penetrate across tight barriers. BIVs penetrated barriers including the endothelial cell barrier in normal mice and the posterior blood retinal barrier in adult mouse eyes, and diffused throughout large tumors and several layers of smooth muscle cells in pig arteries. We demonstrated efficacy for treatment of non-small-cell lung cancer using BIV DOTAP:Chol-p53 DNA-liposome complexes and not by using SUV DOTAP:Chol-p53 DNA-liposome complexes. Therefore, morphology of the complexes is essential. A common belief is that artificial vehicles must be 100 nm or smaller to be effective for systemic delivery. However, this belief is most likely true only for large, inflexible delivery vehicles. Blood cells are several micrometers (up to 7000 nm) in size, and yet have no difficulty circulating in the blood including through the smallest capillaries. However, sickle cell blood cells, which are rigid, do have problems in the circulation. Therefore, we believe that flexibility is a more important issue than size. In fact, BIV DNA-liposome complexes in the size range of 200 to 450 nm produced the highest levels of gene expression in all tissues after intravenous injection. Kupffer cells in the liver quickly clear delivery vehicles (including nonviral vectors and viruses) that are not PEGylated and are smaller than 200 nm. Therefore, increased size of liposomal complexes could extend their circulation time particularly when combined with injection of high colloidal suspensions. BIVs encapsulate nucleic acids and viruses apparently because of the presence of cholesterol in the bilayer, whereas formulations including L-alpha dioleoyl phosphatidyle-thandamine (DOPE) instead of cholesterol could not assemble nucleic acids by a ''wrapping type'' of mechanism, and produced little gene expression in the lungs and no expression in other tissues after intravenous injections. The DOTAP:Chol BIV complexes are flexible and not rigid, are stable in high concentrations of serum, have extended half-life, and circulate efficiently in the bloodstream. Colloidal properties of nucleic acid-liposome complexes also determine the levels of gene expression produced after in vivo delivery. [2,16] These properties include the DNA:lipid ratio, the overall charge density of the complexes, complex size and shape, lipid composition, formulation, and encapsulation efficiency and the colloidal suspension monitored by turbidity measurements at OD400. Our data showed that transfection efficiency in all tissues corresponded to the OD400 of complexes measured prior to intravenous injection. Colloidal properties affect serum stability, protection from nuclease degradation, blood circulation time, and biodistribution of the complexes. Fig. 2 Mechanisms for cell entry of complexes by endocytosis or by direct fusion with the cell membrane. Cell fusion allows delivery of more nucleic acids to the nucleus because the bulk of the nucleic acids do not enter endosomes. The BIV complexes efficiently deliver DNA into cells by fusion with the cell membrane and avoid the endocytic pathway (Fig. 2). Cells are negatively charged on the surface, and cationic complexes have nonspecific ionic charge interactions with cell surfaces that, in part, contribute to efficient transfection. Therefore, we create targeted delivery of our complexes in vivo without the use of PEG to retain predominant entry into cells by direct fusion. These ligand-coated complexes reexpose the overall positive charge by shedding the ''mask'' as they approach the target cells, using a reversible masking technology to bypass nontarget organs and tissues. Through ionic interactions or covalent attachments, we have added monoclonal antibodies, Fab fragments, proteins, partial proteins, peptides, peptide mimetics, small molecules, and drugs to the surface of BIV complexes after mixing. Using novel methods for addition of these ligands to the complexes results in further increased gene expression in the target cells after transfection. Figure 3 shows our optimized strategy to achieve targeted delivery, deshielding, cell fusion, cell and nuclear entry of nucleic acids, and production of gene expression. Fig. 3 Optimized strategy for delivery and gene expression in the target cell including targeted delivery, deshielding, fusion with the cell membrane, entry of nucleic acids into the cell and to the nucleus, and production of gene expression of a cDNA cloned in a plasmid. 2. Fusion of concentrations of serum, about 70% to 100%, which are physiological concentrations of serum found in the bloodstream, and at no or low concentrations of serum. The complexes were unstable at 10% to 50% serum, perhaps because of salt bridging. Therefore, in vitro optimization of serum stability for formulations of cationic complexes must be performed over a broad range of serum concentration to be useful for applications in vivo. Delivery of DNA to the nucleus and subsequent gene expression may be poorly correlated.1-6,17-1 The following issues should be considered independent of the delivery formulation, including suboptimal promoter-enhancers in the plasmid, poor preparation of plasmid DNA, and insensitive detection of gene expression. 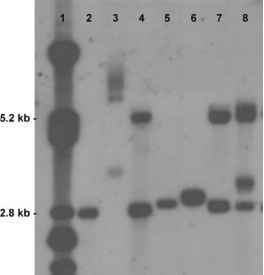 Plasmid expression cassettes typically have not been optimized for animal studies. For example, many plasmids lack a full-length CMV promoter-enhancer, and some variations produce greatly reduced or no gene expression in certain cell types. Ideally, investigators design custom promoter-enhancer chimeras that produce the highest levels of gene expression in their target cells. For example, we designed a systematic approach for customizing plasmids used for breast cancer gene therapy by using expression profiling. To increase long-term expression, use of replication-competent plasmids increase gene expression over time posttransfection. Plasmids can also be engineered to provide for specific or long-term gene expression, replication, or integration. The transfection quality of plasmid DNA is dependent on the preparation protocol and training of the person preparing the DNA. We have also identified large amounts of contaminants in laboratory- and clinical-grade preparations of plasmid DNA and developed three proprietary methods for their detection. These contaminants copurify with DNA by anion exchange chroma-tography and by cesium chloride density gradient centrifugation. Endotoxin removal does not remove these contaminants, and HPLC cannot detect them. To provide the greatest efficacy, safety, and gene expression, these contaminants must be assessed and removed from plasmid DNA preparations. These contaminants belong to a class of molecules known to inhibit both DNA and RNA polymerase activities. Our group and other investigators have shown that intravenous injections of high doses of improved liposomes alone cause no adverse effects. Plasmids with most of CpG sequences removed apparently reduced toxicity after intravenous injections of cationic complexes. However, only low doses containing up to 16.5 mg of DNA per injection into each mouse reduced toxicity, and no significant dose response to CpG motifs in plasmid DNA was demonstrated. Therefore, we believe that removal of the other contaminants in current DNA preparations is the major block to safe intravenous injection of high doses of DNA-liposome complexes. Choosing the most sensitive detection method for gene expression is also essential. For example, detection of p-galactosidase (p-gal) expression is far more sensitive than that for the green fluorescent protein (GFP). Specifically, 500 molecules of p-gal per cell are required for detection using X-gal staining, whereas about 1 million molecules of GFP per cell are required for direct detection, and its detection may be impossible if the fluorescence background of the target cell or tissue is too high. Detection of chloramphenicol acetyltransferase (CAT) is extremely sensitive with little or no background detected in untransfected cells. Few molecules of luciferase in a cell can be detected by luminescence assays of cell or tissue extracts posttransfection, and the sensitivity is highly dependent on the type of instrument used to measure luminescence. Luciferase data may not predict the therapeutic potential of a nonviral delivery system if several hundred or thousand molecules per cell of a therapeutic protein are required to produce efficacy for a certain disease. Furthermore, noninvasive detection of luciferase expression in vivo is not as sensitive as luminescence assays of cell or tissue extracts posttransfection. My colleagues detected luciferase expression in mice by cooled charge-coupled device (CCD) imaging after intravenous injections of BIV DOTAP:Chol-luciferase DNA-lipo-some complexes and detection of HSV-TK gene expression using microPET imaging. To establish the maximal efficacy for the treatment of certain diseases or for vaccine production, administration of the nonviral gene therapeutic, etc. via different routes may be required. The optimal dose and administration schedule should be determined because administering the highest tolerable dose most frequently may not necessarily produce maximal efficacy. 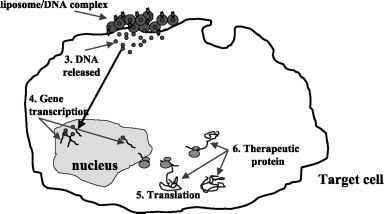 Loss of the therapeutic gene product will vary with the half-life of the protein produced. Therefore, if a therapeutic protein has a longer half-life, then the gene therapy could perhaps be administered less frequently.